As the country moves out of post–World War II optimism through the darker landscape of the Cold War and the social and sexual revolutions of the 1960s and '70s, and then into the unprecedented wealth—for some—of the early 1980s, the Langdon children each follow a different path in a rapidly changing world. And they now have children of their own: twin boys who are best friends and vicious rivals; a girl whose rebellious spirit takes her to the notorious Peoples Temple in San Francisco; and a golden boy who drops out of college to fight in Vietnam—leaving behind a secret legacy that will send shock waves through the Langdon family into the next generation. 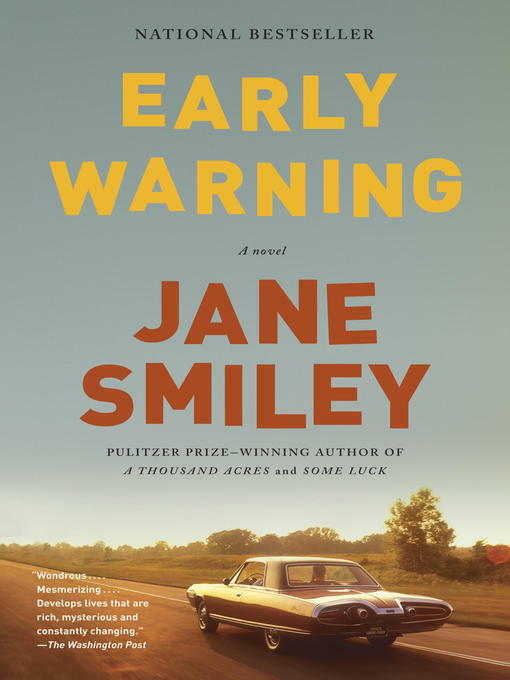 Capturing a transformative period through richly drawn characters we come to know and care deeply for, Early Warning continues Smiley's extraordinary epic trilogy, a gorgeously told saga that began with Some Luck and will span a century in America. But it also stands entirely on its own as an engrossing story of the challenges—and rewards—of family and home, even in the most turbulent of times, all while showcasing a beloved writer at the height of her considerable powers.